Read about our latest release which adds advanced features - security, isolation and fine-grained control - and introduces new insights and analytics on resource usage cost management as well as Kubernetes cross-cloud functionality. Cloudify 4.2 makes operations and resource governance a reality. We have enhanced our Role-Based Access Control (RBAC) with new roles and user groups which allow roles to span multiple tenants. With the new resource availability options, any resource can be made private on a per tenant basis or shared globally for use by all users in all tenants. Template management also gives administrators the ability to customize dashboards per role per tenant. Cloudify 4.2 has made real strides in adding security features designed for large organization. Cloudify now enable Single Sign-On via SAML authentication, with the popular Okta system. Multiple management networks can be defined to support segregated security zones or multi-cloud architectures, for better communication between managed entities and Cloudify.We also enhanced the security of Cloudify agents installation. We made Composer integration in the UI even more seamless with a single, unified login to more easily move between each. Two-way editing has also been introduced - allowing users to edit graphically or straight from the source - making the blueprint creation end-to-end process complete. Cloudify originally made the UI an open framework to offer users the option to create custom widgets for their setups. In working to make this process even more optimal, we have completely open sourced the UI framework. We have also added a new Mac CLI package. Cloudify 4.2 introduces a whole new world for container orchestration with Kubernetes. On top of our already released Kubernetes Plugin for resource management, we are also excited to be launching our Cloudify Kubernetes Provider. The Provider will allow users to utilize Cloudify as a cloud provider, so users can easily deploy a cluster as well as scale and autoscale nodes natively, configure networking and load balancing, have storage and compute customization, and native multi-cloud support. In order to meet the complete standard requirements, TOSCA Simple Profile 1.0 is now supported using the ARIA Plugin. 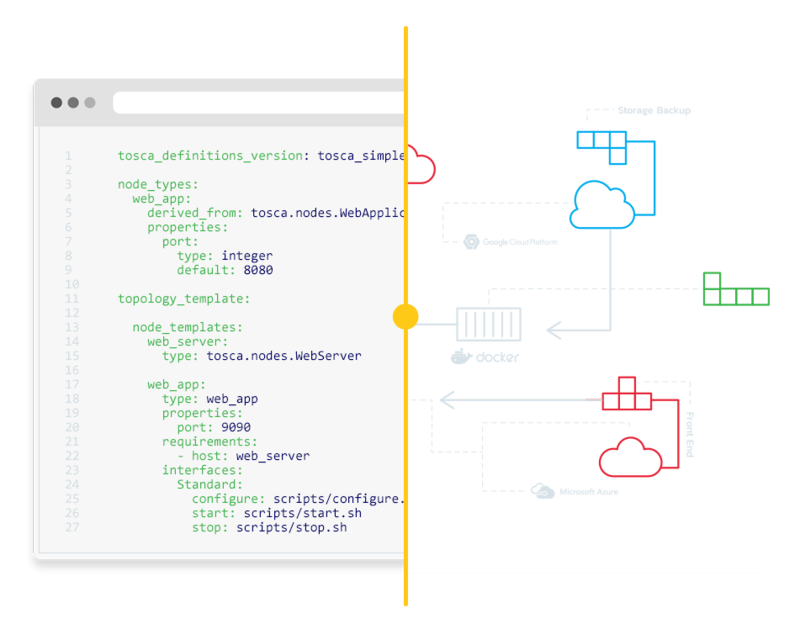 The plugin allows orchestrating TOSCA CSAR packages by introducing a new ARIA node type for Cloudify that exposes Project ARIA’s capabilities to Cloudify.